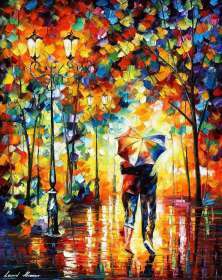 AT THE STEPS — PALETTE KNIFE Oil Painting On Canvas By Leonid Afremov - Size 30"x36"
I would like to present my hand painted oil on canvas painting (recreation) of the artwork AT THE STEPS. I made this piece with the same amount of soul and emotion just like the first original painting. This piece is created with oil paint on artistic canvas using my unique technique of a palette knife. The artwork has texture, you can feel the strokes by touching the painting. 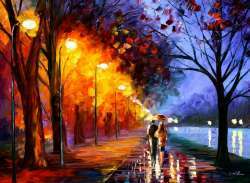 By purchasing on this site, you are buying directly from the artist Leonid Afremov. I guarantee your satisfaction and the best customer experience. Each and every link framed artwork made by Leonid Afremov is not just a nice detail for the interior (although they all are dealing with decoration perfectly well). His paintings are works of high art which is, sure, deep and meaningful. That is why his artworks require your special attention – you cannot enjoy them to the fullest just passing by and thinking of something down-to-earth. Get ready to be absorbed by this painting, become the part of its world and you will be rewarded! We are not going to overload you with technical issues like packaging for framed artwork or getting it delivered to your country right now – this can wait a little bit. Now we want to talk about the essential things, i.e., inner beauty of this painting, its message and ideas. Also, we would like you to try to find an answer to the following question: what story lies behind it? Actually, there is no correct answer to this question, as everybody is free to make up their own stories about this beautiful stranger. What is the mystery of this lady? Choose your own variant – funny or sad, with or without happy-ending - and enjoy it! 1. 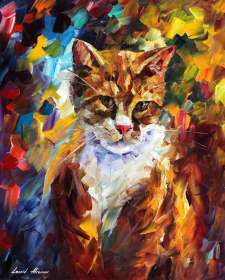 Leonid Afremov’s artworks are very lifelike. They combine happy and sad moments which are always deeply intertwined in our life. However, positive emotions always prevail in his pictures, and this is what makes them so attractive. 2. As we have said, the artist wants us to be co-authors of the painting. Unlock your creativity – who knows, perhaps the world should get ready to meet a new talented author of exciting novels? 3. No matter what you prefer – richly mounted paintings or laconic design – this picture will stand out and become the attention center thanks to its expressive brushwork and emotional charge. If you have come here accidentally (for example, looking for the place to “print artwork canvas” or something like that), you may consider yourself lucky! This gallery is full of surprises and interesting insights into the essence of human nature. Any painting can be your source of inspiration, but it will be more efficient in this role if it is your soulmate. If the painting have found a way to your heart easily, this is it! I have been looking at Leonid's paintings for a while online and one day i started buying the ones i really enjoyed. I now have 9 paintings altogether and each one is extremely well done. A large amount of time, effort, and skill goes into each painting this man makes. I have 2 originals and 7 recreations and each one is superb. This artist is extremely good at making super vibrant, very uplifting paintings that I still spend hours staring at when the mood catches me right and i have the time. I would definitely recommend this artist and site to anyone who needs some amazing artwork. I will definitely buy some more work soon enough if i can find more walls!